While digging through a lot of the data, I spent some time looking at game footage of the Sharks and came away with the same observation as most: holy sh*t, this team is good. Thankfully there are very bright minds who have taken the time to break it down system-wise and provide some great insight. This first article is on shot generation and really how quickly the Sharks shoot once they make a zone entry. Justin Bourne and Thomas Drance do an outstanding job explaining some of the Sharks tactics and how they’re able to control the play. I found in my last post that the Oilers rely more on their forwards for shot attempts and scoring chances compared to the rest of the league. I think we’ll see the defencemen taking on a bigger role, not only getting more scoring chances, but also making more passes that lead to controlled zone entries. This is where Andrej Sekera is going to shine, as he’s proven to be that type of player in the past. 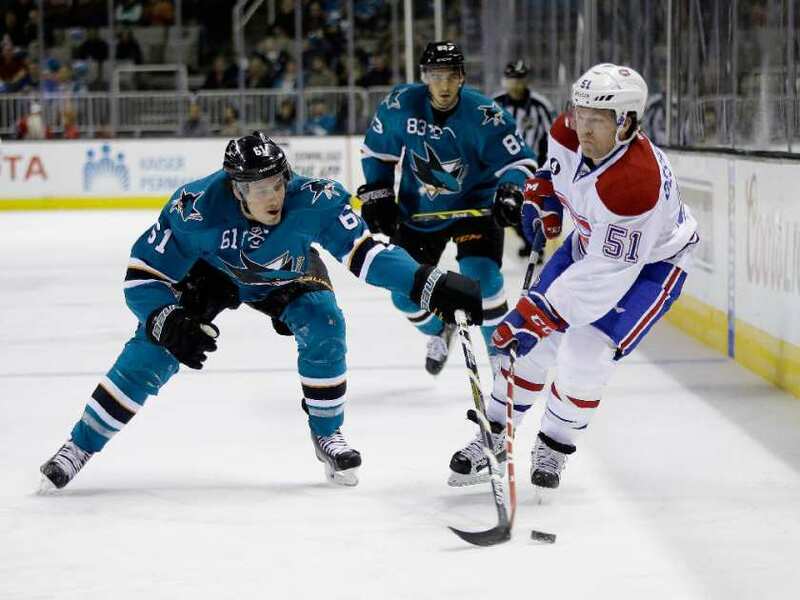 This next one is from Patrick D. of Fear the Fin, who looked at how the Sharks forechecked the opposition and the role each player played to support one another. A very aggressive style, but one that controlled the play along the boards. The Sharks were very good at not only generating shot attempts, regardless of the score, but also blocking shots. That indicates to me that they they didn’t let the opposition set up plays as often as other teams, thanks in small part to their effective forecheck. What’s become obvious is how much pressure they apply to puck carriers and position themselves to take away the options when they don’t have the puck. I think this will be the most difficult tactic to implement for McLellan. San Jose’s Neutral Zone Backside Pressure – Pension Plan Puppets (December 5, 2013). Lastly, J.P. Nikota of Pension Plan Puppets looked at how the Sharks’ forwards apply backside pressure (different from backchecking!) and force the opposition into either dumping the puck or turning it over. This is going to be critical for the Oilers if they want to continue getting contributions from their defence. We know Schultz took a high percentage of the grade-A scoring chances when he was on the ice, but it always came at a cost. The Oilers faced a lot of two-on-ones the other way with Schultz caught up the ice, with very little help from the wingers. If McLellan has the forwards applying effective backside pressure in this type of situation, we might see fewer grade-A scoring chances coming the other way. We know that Todd McLellan is an elite coach, but it’ll be interesting to see how he works and transforms the Oilers roster into a legitimate, dare I say, NHL team. I think we can expect him to employ some of the tactics he has used in the past, but without the skill and experienced roster he had in San Jose, he may need to make some adjustments. The good news is it sounds like McLellan wants to pare down the roster quickly, probably because the players will need time adopting the new system and the expectations that come with it. If there are other articles that are worth checking out, let me know. Please consider the kind and quality of the sharks players compared to Edmonton. Sure he’s got no ring but who do you qualify as a Thornton in Edmonton.